Big Rock campground is located on the Kancamagus Highway 7 miles east of I-93, exit 32. Big Rock campground is a developed recreation area administered by the USDA Forest Service. A fee is charged for the use of this area and is collected through a self-service pay system. The campgrounds are conveniently located near Interstate 93 in the heart of the White Mountain National Forest on the scenic Kancamagus Highway. A variety of recreational opportunities exsist nearby which include; swimming, fishing, hiking, picnicking, sigh-seeing and pleasure driving. Big Rock Campground has 28 individual wooded sites, each with a picnic table, tent pad and turnout for parking. Eight sites share a common parking area, while most other sites have suitable parking space available for small trailers and motorhomes. Water, electrical and sewage connections are not provided. 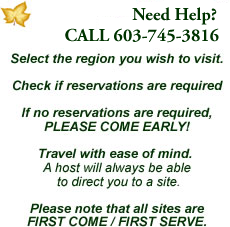 Campsites are available on a first-come, first serve basis. 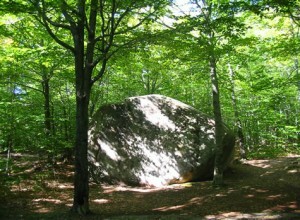 The name “Big Rock” was dervied from a large prominent rock which is visable shortly after entering the campground.